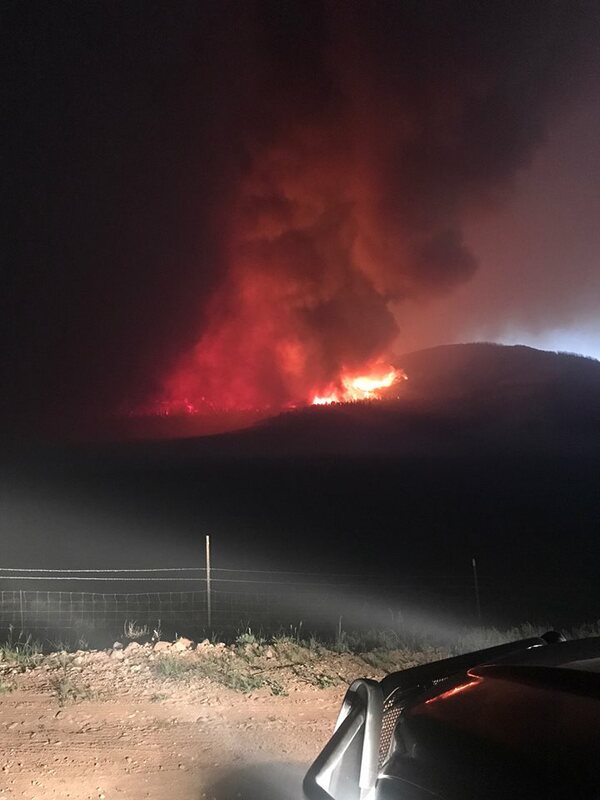 BRIAN HEAD – The Brian Head fire spread more than 2,000 acres Wednesday as firefighters continued to grapple with erratic winds that caused flames to aggressively move in all directions. As of 9:30 p.m., officials said the fire is reported at around 5,000 acres, an increase of more than 2,200 acres from Wednesday morning when reports showed it at nearly 2,760 acres. Additional crews have been ordered to assist on scene as the fire continues to spread with new evacuations ordered in parts of Garfield County and possibly more expected in Iron County, officials said. The community of Brian Head is still evacuated and will remain so until fire managers determine it is safe for residents and visitors to return. All residents up the canyon from about milepost 7 to Brian Head have been evacuated, officials said. Contact the Red Cross for shelter information. Authorities have issued a mandatory evacuation of all residents within the Horse Valley, Beaver Dam Village and Clear Creek areas, Garfield County Sheriff’s public information officer, Denise Dastrup said. “We’ve pulled in approximately 70 to 80 officers and emergency responders who are going from house to house alerting residents to the evacuation,” Dastrup said. “The fires are moving very fast so it’s a very dangerous, tense situation right now,” Dastrup said. Southwest winds are expected Thursday morning, which officials say will continue to spread the fire north and northeast. In the afternoon, winds are forecast to gradually shift from west to northwest accompanying a dry cold front. Temperatures are expected to slightly decrease and relative humidity will remain low. The large smoke plume in the skyline has generated many questions from the public concerned about their safety and property. Gower has asked the public to remain clear of the area. For information on how-to prepare for the threat of a wildfire, fire officials recommend familiarizing yourself with the Ready, Set, Go Program (wildlandfirersg.org/). CLOSURES – Highway 143 remains closed from Parowan to the junction of Highway 148 near Cedar Breaks National Monument. The Dixie National Forest has issued a road and trail closure as well to prevent the public from entering the fire area. The closure includes: Marathon Trail #3224 from Forest Road 048 (Sidney Valley), Sidney Peaks Trail #3210, Mace’s Run Trail #3219, Dark Hollow Trail #3232, Hendricks Lake Trail #3249, and Forest Road 047 (Brian Head Peak Road). Maps are available at https://inciweb.nwcg.gov/incident/5253/. The Brian Head Fire started around midday Saturday and spread very quickly through dense timber on lands managed by Brian Head Town, Iron County, in cooperation with the Utah Division of Forestry, Fire, and State Lands. Dixie National Forest lands remain threatened. St. George News reporter Cody Gaskell-Blowers contributed to this report. So, what is going on in the mind of the person responsible for this fire? Probably not a lot of brain cells there to process feelings of guilt.